​Smoky fog, or smog, is becoming an evolving problem in many areas in the world. Smog is a type of visible air pollution that is composed of nitrogen oxides, sulfur oxides, ozone, smoke or particulates including carbon monoxide, and radioactive sources. Smog created by human activities is derived from coal emissions, vehicular emissions, industrial emissions, forest and agricultural fires and photochemical reactions of these emissions. The atmospheric pollution levels of Los Angeles, Beijing, Delhi, Mexico City and other cities are increased by inversion that traps pollution close to the ground. The recommended starting dose is 1 capsule administered orally twice daily, preferably with food. 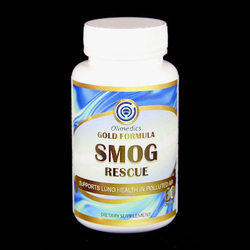 The absorption of Smog Rescue is expected to be increased in the presence of food. A dose decrease down to 1 capsule per day should be considered for people who do not tolerate higher doses.